With each description, an estimated cost/square meter is shown. These should be seen as purely indicators as costing can only accurately be determined when footing struture costs and stone types are chosen. The speed of constructing the wall will certainly play a large part in the cost and at Grassroots, we rely on using skilled wallers who come with a varied portfolio. One of our finest walls. Cool, sophisticated, impressive. Built by Nick Leitch, one of Wiltshire's finest stone-wallers, this wall is the main view from a kitchen/lounge window. The oak beams overhead radiate around the house, supported by the wall. 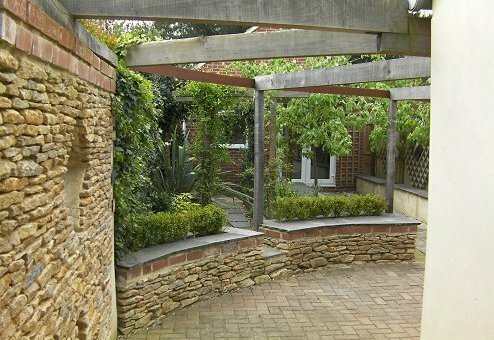 The curving lower wall serve's as a seat aswell as a garden divider. 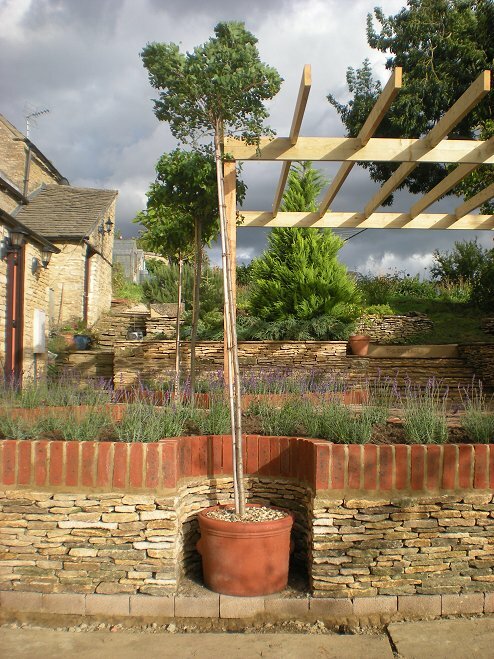 This Sherston Garden is a typical engineering feat built on a sloping site. Quite unbelievably however, was that all the stone in this garden was quarried from within the garden! Trully miraculous, and saved the clients a fair amount of money. The red brick capping "soldiers" are forming some intricately shaped raised planters. The perfect semi-circular niche that you can see, was a clever design to enable some timber vegetable beds to be constructed below the wall. 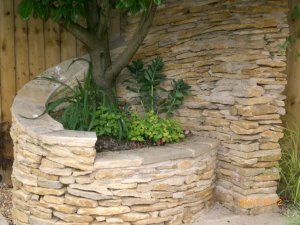 Dry Stone Walling is undoubtedly the finest form of walling, fencing, retaining or barrier that you could wish for. Over a short term it is not cheap when compared to other walling/fencing materials. But when you consider that when constructed properly and with the correct type of stone for the job, a stone wall will last for hundreds of years. Year after year it will look fantastic and generations of families will admire it. Around Malmesbury, we have many quarries to choose from, offering a variety of stone. 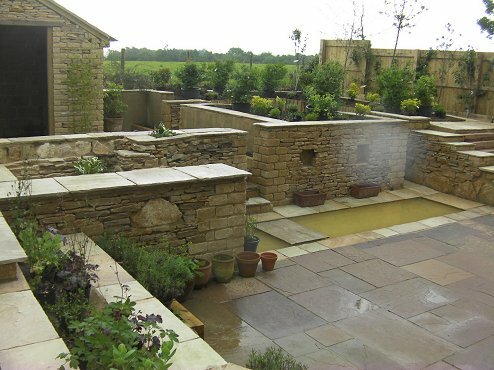 We at Grassroots have developed many ways of building with stone and when used with other appropriate materials, there is not a garden in Britain that won't be enhanced by it's magical appeal. If you are considering a stone wall or feature within your property, please consider us to deliver some stone magic to you.